My friend Varun and I finished work early today and decided to head out. We first wanted to capture the sunset, but by the time we reached the place it was dark. So we deiced do a small night trek and climbed the hill. The view from top is fabulus. Last but not the least, I wanted to click the start streak, so I did a 5 min exposure. 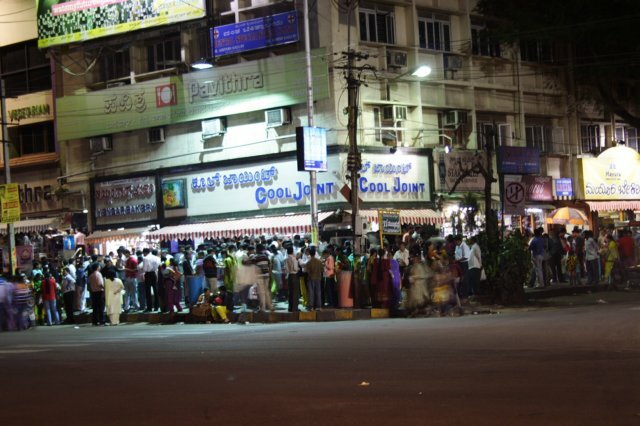 Jayanagar… something I always wanted to capture. The best part of jayanagar I like is that it caters to all classes of people. The rich, the middle class, and the poor. I’ve seen all kinds of fancy restaurants to simple restaurants. From Branded shops to foot path vendors. I’ve always loved this kind of place and I hope jayanagar remains this way. Having studied in vijaya jr. for 2 years cool joint was my fav place. I still love the sandwiches they make. As I write this blog my mouth is already watering….